• Jubilee - Contra Dance with fiddle and flute, and more. This band has been around since the early 1980s. • Crooked Road - Traditional Irish band in which Denise plays concertina. The band also features Ben Saylor, Jim Kerr and Maura Walsh. Denise also plays English concertina professionally, especially with other local players of Irish music. Contact her about this if you're interested, and please visit the concertina page. Generally we ask for $50/per person per hour, with a $100 minimum. Travel expenses for outisde of Anchorage, and for use of sound gear (which we can provide when needed) must be negotiated. 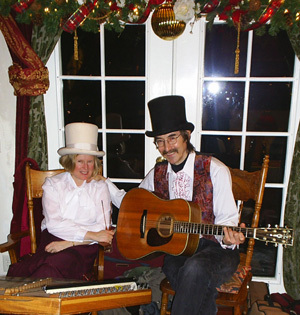 If your event requires live music with a specific theme, such as Christmas, Irish, Renaissance, or Alaskan Sourdough, Denise & Jim can dress the part. Their extensive repertoire and variety of styles can add hours of festive music to your event.